Hampshire building services company Closewood have added mechanical and electrical services to their well-established air conditioning arm. Their latest success has been to secure a new electrical installation project at Godolphin school in Slough, but the wait to hear if their tender had been accepted, was a little longer than expected. "We put the proposal together in October last year," said Electrical manager Tony Speight, "and we didn’t hear anything positive until January." "In this business you are used to waiting and having to react quickly. But you usually know there will be good news when the telephone rings after a couple of weeks after tender submission and the client or project manager starts asking questions about the job." "With this one it became a little tense as we only heard that we were in with a chance in January, but we still had to wait a month for the final signature." Godolphin is a boarding school for girls that has a register of four hundred pupils. The project is a new eight classroom building with a state of the art installation. "Our role is to install all the electrical elements for the building," said Tony. "From light and power sockets and cabling, power supplies for mechanical equipment, CCTV, an intruder alert system, fire alarms, wiring for interactive whiteboards and data cabling throughout." 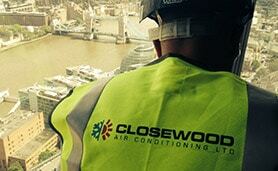 This contract comes on the tail of mechanical and air conditioning work Closewood provided for the Shard in London. Along with having design input, Closewood were also involved in the installation and commissioning of ventilation, hot & cold water services, heating and drainage systems and insulation on various floors from the ground floor up to level 52. Other prestigious projects for this Havant based company include the National Lottery television studio, the Olympic Village and Arundel Castle, along with pre-planned maintenance contracts as far afield as Cumbria. This entry was posted in News on April 14, 2015 by splice.